The Motor Trades Association of Queensland (MTAQ), the automotive industry’s peak body for Queensland, has launched the MTAiQ innovation hub. The MTAiQ is the first such facility in Australia to be focused exclusively on the automotive industry and was established in response to the enormous technological change sweeping through the industry. The iQ hub will bring together mentors, investors, coaches, commercial partners and industry experts to collaborate with both start-up businesses and entrepreneurs as well as established businesses looking to capitalise on the changing landscape of industry. The iQ hub, located at MTA Queensland’s head office in Brisbane, offers a hi-tech home for fledgling businesses. High-speed internet access, first-class presentation and hot desk office facilities, as well as state-of-the-art audio-visual equipment is all available to hub clients. Additionally, clients will have access to experts in the fields of ICT, business innovation, finance management, marketing and communications, and Australian law. Several businesses have already been welcomed as clients of the MTAiQ, and these include start-ups that are developing concepts in tyre sales and distribution, new vehicle sales, lead management, and digital technology for use in the mechanical repair trade. According to Dr Brett Dale, the Group Chief Executive, the MTAiQ innovation hub will help establish Queensland as a centre of automotive innovation and create opportunities and growth that will have a positive effect on the industry and the wider community. 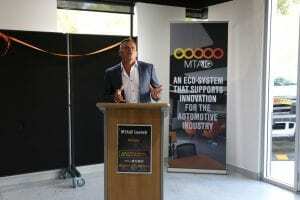 “The technology coming to our industry – such as driverless vehicles, new electric vehicles and the way those vehicles are charged and the application of virtual and augmented reality in business processes means that in a few years’ time, not too many businesses will look as they do today,” he said during the MTAiQ launch presentation last week. “By 2020 we will see significant changes to our industry and by 2022 the major impact to business will be here. And that is no time at all. More than ever, we need to collaborate to innovate and I believe this facility is totally relevant to where we need to be in the 21st century,” he added. “As a group, MTA Queensland is committed to leading in the innovation space. We are committed to driving opportunities for industry, supporting existing business to transform their business model to ensure they are postured for maximum opportunity, and to bringing in new start-ups that are relevant to our industry and that will service and add value, not only to that industry but to our community in general,” concluded Mr Dale. To make an enquiry about the MTAiQ Hub please email info@mtaiq.com.au.